No other animal had a greater influence on the exploration of the American West than did the beaver. Trappers, led by the French, began to penetrate the interior of the current states of Montana, Idaho and Wyoming in the latter part of the 1700s. In 1804 Lewis and Clark commenced their famous trip to explore the Louisiana Purchase. When they returned they brought news of extensive numbers of beavers in the land they had just explored. By the early 1830s, barely 25 years after the conclusion of the Lewis and Clarks expedition, the beaver had been trapped out of many areas. In 1834 the American Fur Company, owned by John Jacob Astor, sold out his Western trapping operations due to a scarcity of beaver, and a declining demand for their fur. The fabulous days of the beaver fur trade were over. Besides its impact on the exploration of the American West, the beaver had a tremendous impact on the overall look of the areas in which it lived. Except for man, no other mammal has the ability to radically change the landscape. Many of the western rivers originated in the high mountains, and plunged headlong towards the sea, carrying with them minerals and soil particles. Beavers moved into the high mountain valleys and constructed dams. This dam building activity accomplished two things: it created a pond where the minerals and soil particles settled out, and it opened up the forest, creating an open valley. Both of these activities would prove to be of great benefit to the first permanent settlers who followed the Mountain Men. Beavers belong to the rodent family and may reach a weight of over 60 pounds. They are covered with a dense, deep brown coat. From the tip of the tail to the end of their nose they are 3 to 4 1/2 feet long. They swim by using their webbed hind feet and broad flat tail. Beavers can set upright, using their tails for balance. Their food consists of the bark and the outer layers of aspens, alders, birches and willows. In addition, various parts of many aquatic plants are consumed. In cutting a tree they use their large upper teeth for leverage, the cutting action is performed by the lower teeth. Larger trees are peeled where they fall and smaller sections are dragged to the water for use in dam building or for food. Beavers will travel up to 200 yards from the water to obtain trees, however they are reluctant to do so for long and will soon abandon a location when the available trees are too far from the water. Under the proper conditions beavers can construct very substantial dams. These large dams create very impressive impoundments. Dams of over 2,000 feet in length have been recorded, but most dams are less than 100 feet in length. The impoundments they create provide valuable habitat for various types of wildlife. Ducks and geese utilize them for feeding and nesting. 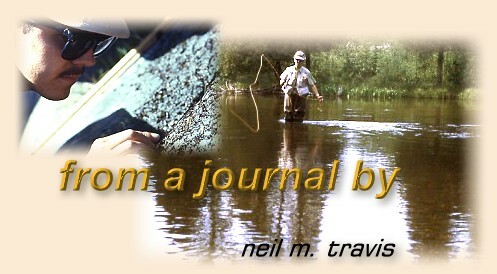 Trout, especially brook trout, benefit from the increased insect population that is associated with the pond. Moose find them a ready source of food, and other ungulates, like deer and elk are attracted to the clearing that the they create. For many years beavers were kept in check by natural forces and by trapping. In our modern era the wearing of fur is out of vogue, and in many areas beaver numbers have soared. Unchecked, the beavers have become a nuisance, cutting trees in suburban backyards, damning up irrigation ditches and thwarting stream rehabilitation projects. In parts of the Pacific Northwest beaver activity has blocked salmon spawning streams, especially in the headwaters. Abandoned beaver dams rapidly fill with silt, and quickly become unsuitable for trout. Anglers will rarely encounter beavers during the daylight hours, since they are normally active only during the early morning and evening hours. A startled beaver will slap its tail vigorously on the surface of the water, creating a sound as sharp as the retort of a rifle. In the calm stillness of evening or early morning it can set the heart to racing.